Almost 100 guests gathered to mingle and reconnect. 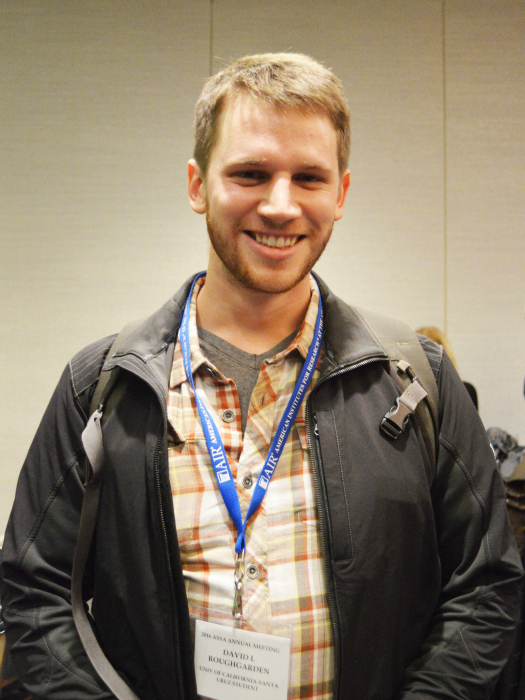 Guests included current and former faculty, graduate students, alumni, as well as industry collaborators. 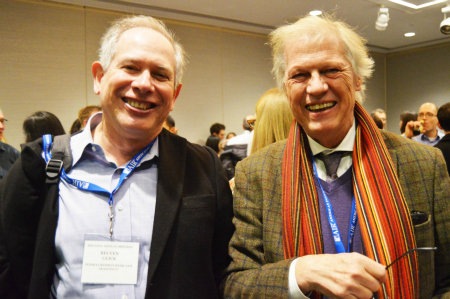 Attendees included Reuven Glick (left), Vice President of International Research at the Federal Reserve Bank of San Francisco and Clas Wihlborg of Chapman University. 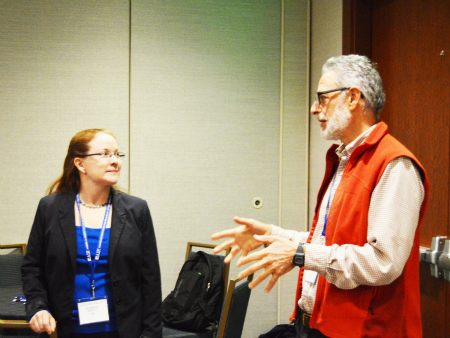 Kathleen McDill (International Economics, ’00) now a senior financial economist at the Federal Deposit Insurance Corporation in Washington D.C. is pictured chatting with Distinguished Professor Daniel Friedman (right). Since the Economics Ph.D. program at UC Santa Cruz was launched 25 years ago, almost 150 students from across the globe have come to study with the department’s internationally recognized economists. 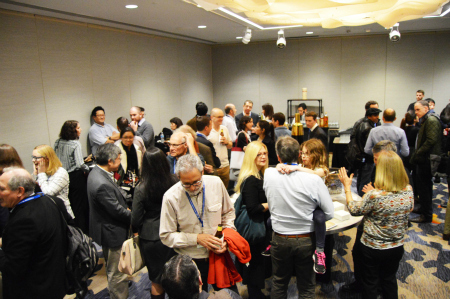 To honor the 25 year milestone, the department hosted a reception on January 3, 2016 at the annual American Economics Association meeting in San Francisco. 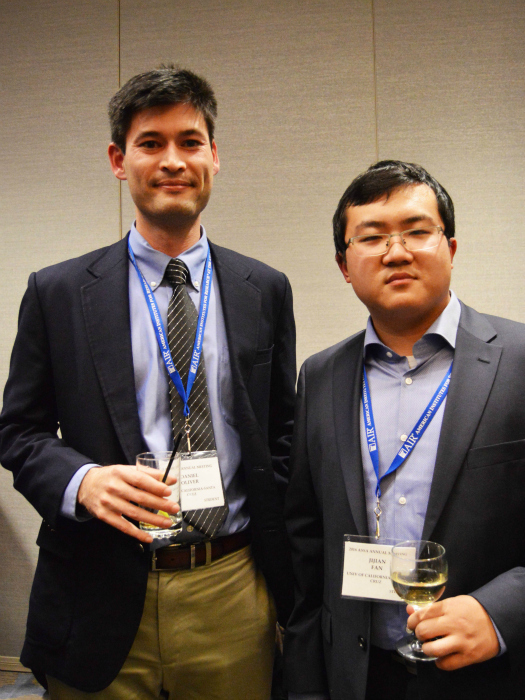 Current and former faculty, graduate students, alumni, as well as industry colleagues gathered to mingle at the major economics event. 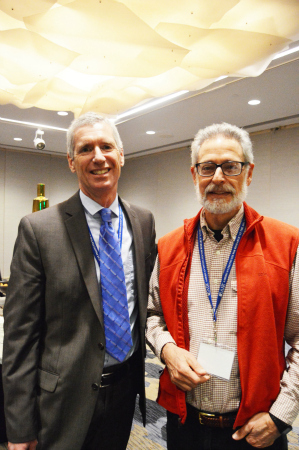 Attendees included Michael Hutchison’s lifelong collaborator, Reuven Glick, Vice President of International Research at the Federal Reserve Bank of San Francisco. Hutchison and Glick have published almost 30 articles together on a range of topics from exchange rate policy to capital controls and currency crises. Also in attendance was Kathleen McDill (International Economics, ’00), who is now a senior financial economist at the Federal Deposit Insurance Corporation in Washington D.C.
Other attendees included Frank Westermann (International Economics, ’98), Director of the Institute of Empirical Economic Research at Osnabrueck University in Germany and Alessandra Cassar (International Economics ’01), now a professor at the University of San Francisco. From Brazil to Belarus, Guatemala to Greece, Turkey to Taiwan, the Ph.D. program has attracted future economic leaders eager to explore ways to apply economics as a tool for tangible change. Notable alumni include the first woman to sit on the governing board of Switzerland’s central bank Andrea Maechler (International Economics, ’99) and Daniel Beltran, the Senior Economist of the Global Financial Flows Group at the Board of Governors of the Federal Reserve System. Other alumni include Rasmus Fatum (International Economics ’01), the Department Chair and Foote Professor in International Business at the Alberta School of Business in Canada and Ilan Noy (International Economics, ’03), Chair in the Economics of Disasters at the School of Economics and Finance Vicktoria University in New Zealand. Alumni have gone on to work in academia and industry - including consultancy firms, international banks, and central governments. In recognition of the 25th Anniversary, the department is focusing on fundraising for Ph.D. student fellowships. The goal is to offer several fellowships each year to first-year Ph.D. students in order to attract and retain top talented students, and to ensure access for those qualified students who might otherwise find it difficult to pursue graduate study full-time as they establish their academic path. These fellowships are critical to helping students complete their studies with as little debt as possible and allowi them to pursue the career that most fits their interest, skills and capabilities. 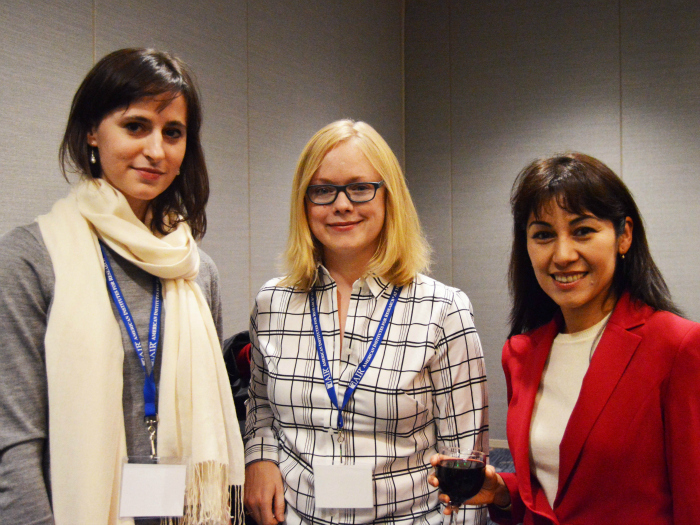 More photos from the event: Alumni Manizha Sharifova (right) graduated a year ago and is currently an assistant professor at University of the Pacific in Stockton. Luba Peterson (middle) is now an assistant professor at Simon Fraser University in British Columbia, Canada. Her recent work looks at how monetary policy and central bank communication can stabilize expectations and markets. Former graduate student is Olga Rud who is now at Bates College is on the left. 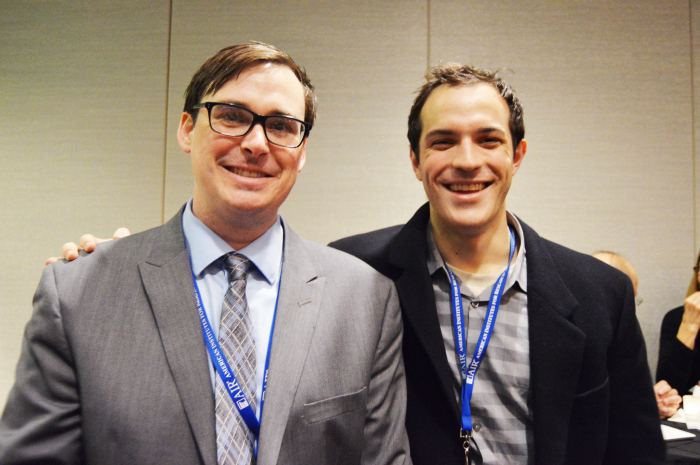 Curtis Kephart (left), research fellow at lab manager at the Learning and Experimental Economics Projects of UC Santa Cruz with undergraduate alumnus Jeremy Pearce ('12), now a Ph.D. candidate at the University of Chicago. Prior to matriculating in a doctoral degree, Pearce worked as a Research Associate for the Federal Reserve Bank of San Francisco. Former UC Santa Cruz professor, Menzie Chinn (right) is now a professor of public affairs and economics at the University of Wisconsin-Madison. He worked in the Economics Department from 1991-2005. 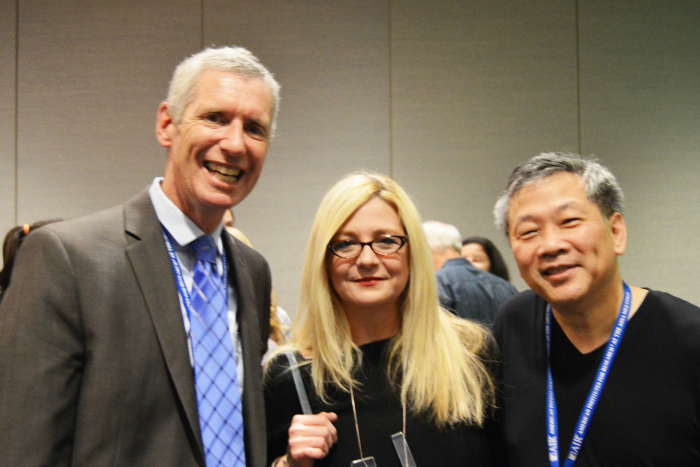 He is pictured here with his wife Laura Schwendinger and Department Chair Rob Fairlie (left). Alumnus David Roughgarden ('11) is now working as a Field Research Assistant in Tanzania as a part of professor Jon Robinson's research.